£6.30 for people with NUS cards. Sounds good to me. 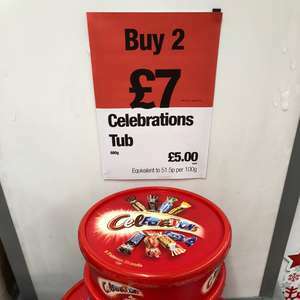 Weren't they this price in most supermarkets for most of November ? What happened to the 750g ones from last year? Which were the same price! £5.60 for Co-op employees today only (double discount 22nd and 23rd December). £5.60 for Co-op employees today only (double discount 22nd and 23rd …£5.60 for Co-op employees today only (double discount 22nd and 23rd December). Don't you know, we get less every year. Won't be long before we get peanut sized tubs for same price. Deal posting newbie! This is luketelfer first deal post. Help out by leaving a posting tip or just to show your appreciation for their contribution.